The primary advantage of this abrasive is its ability to STRETCH! This stretch allows the abrasive to conform to a mildly contoured profile wheel. 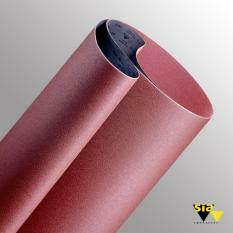 its velcro-type backing makes changing abrasive fast, clean, and easy. Simply pull the worn abrasive off and stretch a new piece onto the wheel. Successful applications include details on cabinet door and drawer front edges, crowned panels for doors, etc..